When I first saw this book, the premise for it intrigued me right away. A ship found completely abandoned at sea with no apparent explanations. I love a good sea-faring adventure, and I was expecting to join the crew of the Mary Celeste on their last big adventure, but that’s not quite how the book turned out. The title is a bit misleading. We don’t actually get to join the crew of the Mary Celeste until the end of the book. However, the story that I ended up reading was still engaging and enjoyable with a few historical figures and events thrown in for extra fun. 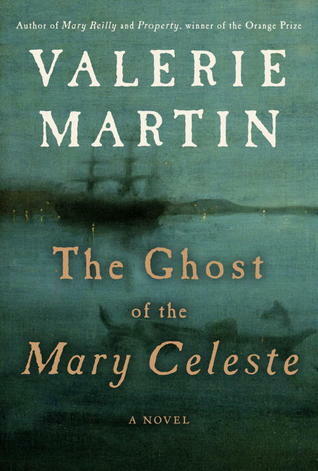 This book is a fictional account of what happened on the Mary Celeste. If you want to find out more about the real Mary Celeste, you can read about it here. The ship was found abandoned on December 5, 1872, with one lifeboat missing. Everyone’s belongings were still on board, as though they had left in a hurry, but none of the crew has ever been seen or heard from again. The bulk of the story in The Ghost of the Mary Celeste is about the family of the Captain and his wife who had been sailing on the Mary Celeste, in particular the sister of the Captain’s wife. Arthur Conan Doyle also plays a big part in this story. After he first heard the story of the Mary Celeste, he decided to write a fictional story about it, which ends up making it all the way to America. Dr. Doyle then comes to American on tour and meets up with a mysterious clairvoyant, named Violet Petra. The story of Violet Petra takes us into the world of spiritualism in the mid-to-late 1800s, which I had known nothing about until reading this book. Arthur Conan Doyle, himself, was one of the scientists of the time who was interested in spiritualism and the investigations of the phenomenon. My favourite parts of the book are still the sea-faring parts. They reminded me of The Sea Captain’s Wife by Beth Powning, which I love. In The Ghost of the Mary Celeste, the story begins at sea, and it ends at sea. There is something about life at sea that fascinates me. When I read about it, I find myself strangely wishing I was there (not as the captain or the crew, though, so I guess as the wife) even though, after all I’ve read, I know it would be the end of me. And I definitely have no interest in that. These two are from Dr. Doyle’s thoughts during his time at sea. I love the imagery, although a bit morbid. The sailors referred to the end of time as that day when the sea gives up its dead. It was a cliche, but Doyle vexed his brain to imagine that day. It might, after all, be tomorrow. Would the waters withdraw and the souls of the dead rise up through the wreckage of the ships littering the ocean floor? Or would the dead be disgorged onto the coasts of every landmass, clinging to rocks, floundering in the shallows, pushing forward in waves like the sea itself, waves of the dead, with their pale flesh and hollow eyes? If every living soul on earth were dropped into the deep, would it even raise the level of the oceans? Would a great tidal wave be engendered that would sweep across the sea and flatten everything, including islands and coastal cities that stood in its path? And, even if that did happen, it would make no difference. The oceans of the world could absorb mankind entire and still the tides would roll in and out, the sun would rise and set, the moon wax and wane, pulling the waves to the shore. What madness, What vanity of men, to sail about in fragile wooden boxes tricked out with sails, putting their lives, their fortunes, their families at the mercy of this ravenous, murderous, heartless beast of a sea. After reading this book, and the other true accounts about the mysterious Mary Celeste, there is still one problem: I will never know what really happened on board that ship. It remains a mystery. Any recommendations for good tales of the sea? Thanks for reviewing this book, Naomi! I read about it recently and like you I was fascinated, and I immediately put it on my TR list. You mentioned that the bulk of the story is about the captain’s family. Would you call it a mystery? What was the “feel” of the book like? Good question! The title, and even the look of the cover, is slightly misleading. I wouldn’t call it a mystery, although the event that the book is named after is certainly mysterious. I’m not very good at identifying specific genres, but I would have to call it historical fiction. And, although the story is based on the event surrounding The Mary Celeste, it is more an exploration of spiritualism and seeing beyond the living, which eventually ties into the missing crew of the ship. I guess I should have put that into my review, because, now that I think of it, if I had known that about the book before reading it, I probably would have gotten more out of it. In the end, though, I did get a lot out of it. If you like learning about historical figures and events through fiction, then I think you would like this book. Good! I hope you like it! I’ve never read a book that includes sea-faring adventures. I might add this one to the list. I love books that’s based on a historic event. However, depending on the book, I don’t always appreciate when a book leaves me wondering. If you like books based on historical events, then I think you would like this book. I learned some new things! It is not really the book that leaves you wondering, only the fact that the real mystery of The Mary Celeste has never been solved. I thought this was a pretty fascinating novel. I reviewed it last fall. I agree! There was a lot more to it than it seems. Very intrigued with Arthur Conan Doyle as a character in the story. I learned so much about him that I didn’t know! Very interesting! Thanks for the link! If you end up reading this, I hope you enjoy it – and thanks for the comment!